How Long to Cook Broccoli? Perfect Every Time. Little wonder why so many people hate broccoli. John and Michael used to loathe it. When we cooked it 30 seconds too little, the broccoli was still raw and crunchy. When we cooked the veggie 30 seconds too long, it got mushy and olive-colored, which is not a good look for broccoli. This technique nails it–just right–and simply requires a timer. John and Michael eat this broccoli 3 times a week. 1. Bring 3 inches of water to boil on high temperature in a covered saucepan or pot. 2. Cut the florets off the broccoli head, and if the florets are too big, cut them in half. Put the florets in a bowl so that you can dump them all into the boiling water at the same time. Set your timer for 2 minutes and 30 seconds (2:30), but don’t start it. Have a big spoon ready. (If cooking more than 2 heads of broccoli, increase time to 2:50). 3. When the water boils, remove the cover, dump the broccoli into the water, and give it a quick stir so that all the broccoli gets dunked. 4. Clamp the lid on tightly, and start the timer. 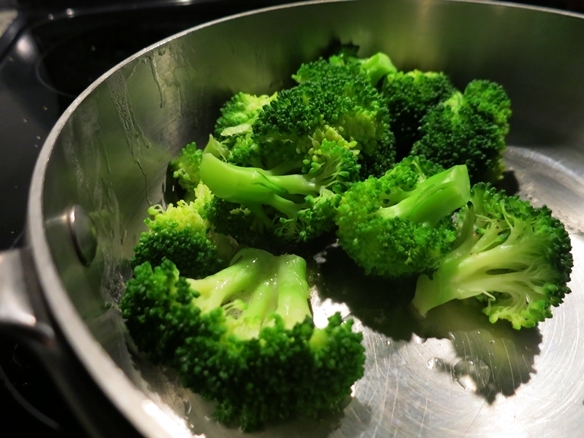 When 2:30 is up, turn off the heat and immediately drain the broccoli, or remove it with a slotted spoon. If you use the lid to strain the water out of the pan, wait about 15 seconds and strain it again to get all of the water out. 5. Put a few pats of butter on the broccoli, and leave it uncovered until the butter melts. Stir the broccoli with a large spoon or chopstick–very lightly so you don’t break off pieces of the florets. Salt and pepper the broccoli, and serve. If desired, sprinkle the broccoli with cheese, preferably a cheddar or other yellow cheese. White cheeses aren’t the best for this vegetable. Tostito’s Medium Salsa con Queso is cheesy- delicious poured over the top.